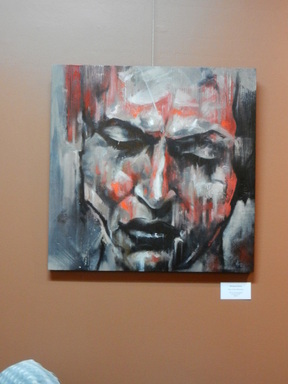 Michael's work is part of the "First Four" exhibit at Allentown Art Works. The exhibit, honestly, I could not wait for. 2014, Expressions Studio takes over curating exhibits at the Art Works. With a lot of people there, I changed the one way I do interviews: on the spot. Michael was my first victim, I mean person for the new style. Just kidding on the victim part. I used my initials to avoid confusion. Part 1 pretty much covered Michael's background and the exhibit opening. I had to throw in a serious curve. Time to find out what he thinks about digital vs. traditional art among other things. M.P. : What are your thoughts about "traditional (drawing / painting / etc.)" vs. digital and doing it on a touchscreen? Do you feel this is the evolution of art? Michael: Different media, completely. I work as a graphic artist. I use Photoshop. I can use some of the 3d apps. I did 3d graphics for years (he mentioned 3ds Max). It's just another tool, it really is. You can do some really cool stuff. It's the artist behind the tool! You can really see the difference with someone hacking in Photoshop vs. someone who can really paint (digitally). M.P. : Using a stylus to a touchscreen. Michael: Yeah! it's just like painting. You have 1001 brushes in your hand. M.P. : You have the limitless color and "Thank God for the 'undo' button!!! Michael: (Seriously cracking up): I love with Photoshop, the 'history' and 'undo' palette!!! M.P. : Do you think this will be your last show? Michael (laughing): I hope not. This is a lot of fun! M.P. : Looking at work and taking a photo, what genre / style would you say your art is? Michael: I am becoming more Expressionistic. It's figurative Expressionism at this point. It's hard to classify, but, somewhere in that area. M.P. : In today's world, it seems to be getting harder and harder to classify art. Other than painting something like a cliff and beach (example). Am I correct on this? Michael: Exactly. M.P. : Years ago, it was easy to classify. Now, like in other areas; there is a blending of genres. Michael: That's just it, the blending. We have so much around us. The influences are endless. We have the digital on top of that. You can't really pigeonhole any of it, for the most part that I have seen recently. It's amazing, the evolution. I did mention one genre, Street Art. M.P. : Street Art does include Graffiti now. Michael: Oh, absolutely! Beautiful work being done. It has become an accepted form of art. M.P. : Any sneak peaks on what you have coming up? Michael (smiling): Thinking about it, it kind of goes day by day. I have 5 or 6 going right now at the same time. We were talking about having multiple projects and the inevitable "creative block". M.P. : How do you overcome "creative block"? How would suggest other people overcome it? Michael: For me, I usually walk away from it until I get the bug (creative). If I don't get it within a week or two, I force myself to sit in front of something usually blank. Inevitably, within 20 minutes, I am sucked into it. M.P. : Advice for other artists, no matter the age or people who want to try? Michael: Just do it. Jump into it. Don't over think it. M.P. : Would you suggest trying to put pressure on yourself and be as good as others? Michael: Just enjoy it. That is what I try to do. I really try not to make it a job. I just go and try to enjoy it. M.P. : You don't do it for the money, you do it because you love it? Michael: I love it! I have come to love it, I really have. M.P. : Promoting your work. Obviously, you have the local galleries / shows. Thoughts on social media and different methods of promoting? Michael: Right now, that's the only way I have promoted. That's how Femi (Expressions Studio) found me, on Facebook. I have a page for my artwork. It's a fantastic way to get the word out. M.P. : You would suggest as many, relevant, social networking sites as possible? Michael: There are a lot of good ones and a lot of good little communities to get the work out and get feedback on. Yes, I do have parts of doing this I personally love! Interviews are one of them. I want to seriously thank Michael Hess for taking his time for the interview. Especially during the opening reception where artists are busy answering questions and talking to people. Thank you for checking out the interview and the magazine!